3DPrint.com head office is stationed in sunny Florida, I’m here in northeast Ohio, where we’re still waiting in mid-May for spring to settle in for sure. Back in February, I skipped out on Cleveland’s -20°F cold front and hopped a plane down to visit a friend in south Florida for a week. As my fiancé and family continued to freeze, my friend asked if I wanted to go down to the ocean one evening, so we could see if the sea turtles were coming in. Aside from my obvious cheer at weather that was actually a ‘real feel’ of a solid 100° temperature difference (it’s a different world, going from -20° to 80° in one day) and frolicking beachside, I was so excited to go see the turtles–few animals in nature are quite as impressive, long-lived, and stately as the sea turtle. Seven species of sea turtle currently live around the world, and four are classified as either “endangered” or “critically endangered,” with another two being “vulnerable” to joining their ranks. One of the endangered species, the Caretta caretta or loggerhead sea turtle, has a lifespan of up to almost 70 years and can be found in the Atlantic, Indian, and Pacific Oceans, as well as the Mediterranean Sea–all places where, especially since they need to lay their eggs on land, they are unfortunately susceptible to the negative environmental influence brought about by humans. In Turkey, a loggerhead sea turtle was recently brought to the Sea Turtle Research, Rescue and Rehabilitation Center at Pamukkale University (PAU). 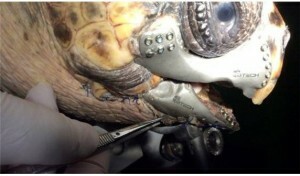 The turtle, which they called AKUT3, had significant damage to its upper and lower jaws, and the team at PAU noted that the turtle was unable to feed on its own in the wild. The Sea Turtle Research, Rescue and Rehabilitation Center at PAU was quick to help, and it turned out that the turtle’s best chance for healing came courtesy of 3D printing. 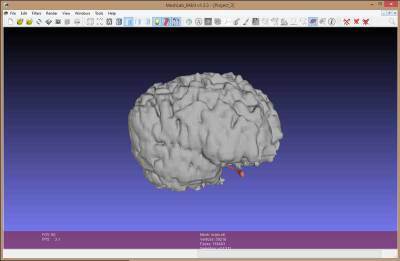 The Center’s director, Prof. Dr. Yakup Kaska, noted that 3D technology proved to be the best hope for the turtle–and this particular operation would represent the first time in the world that a sea turtle would benefit from the technology. 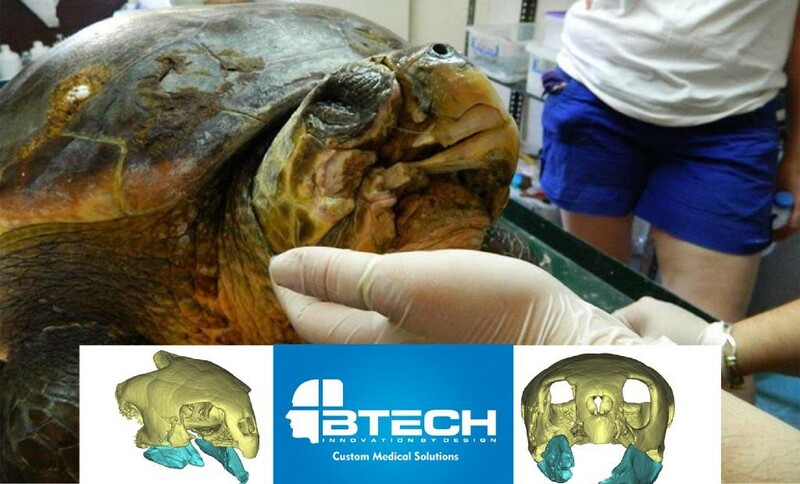 BTech Innovation, “the first private R&D corporation in Turkey,” has extensive experience with 3D technology for medical applications–creating medical-grade implants, models, and prostheses–and came to the turtle’s aid. 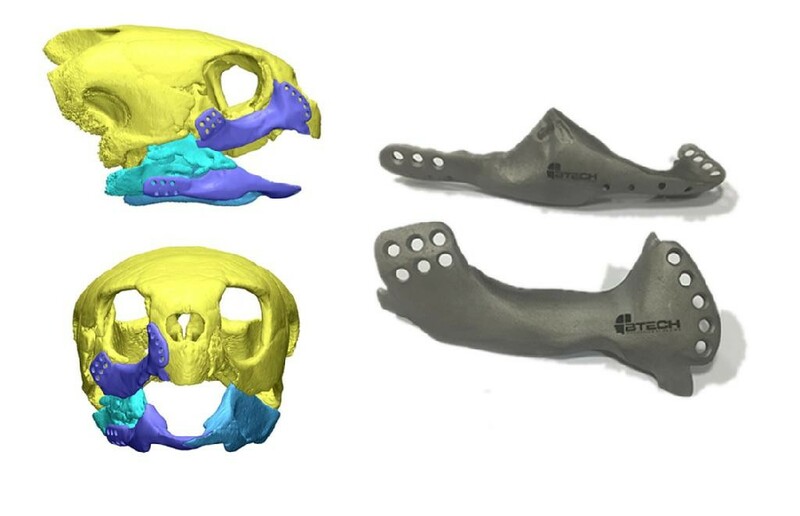 Using CT scans from the turtle’s veterinary care, the BTech team used the Mimics Innovation Suite from Materialise to create a 3D model of the affected areas of the turtle’s jaws. 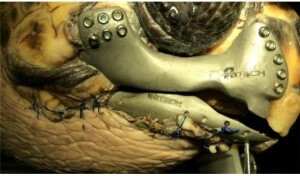 Ultimately, BTech took the models created to design an implant for the turtle, 3D printing it in titanium. 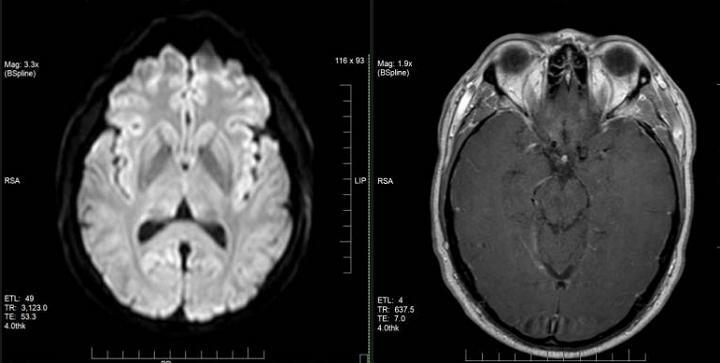 The surgery was a success and the patient is recovering quite nicely, though that process is sure in itself to require some time. The turtle’s veterinary surgeon, Prof. Dr. Anas M. Anderson, noted that the turtle did not show any signs of rejecting the implant, following a post-op examination 18 days after the procedure. While I didn’t actually get to see any sea turtles on my Floridian jaunt a few months ago, it’s wonderful to know that thanks to the efforts of caring veterinary teams around the world, there will still be more chances to see these incredible, endangered gentle giants as their health needs can be met and their lives saved. Have you heard of similar stories of 3D printed implants in the veterinary world? Let us know what you think of this one in the 3D Printed Titanium Jaw Implant for a Sea Turtle forum thread over at 3DPB.com. Anything’s possible with 3D printing ! The rapid technological development of 3D imagery and 3D printing is so advanced that actors will only have to be filmed once before their image can be replicated for any facial expression; reefs can be transported and rebuilt around the world and soon you will be able to design and print your own surfboard at home. And it is all happening right now. Mark Ruff is an internationally acclaimed photographer who has received awards from around the globe. He has set up a company, 3D Body Scan, where 3D imaging is changing the future of motion pictures around the world. “I didn’t invent the technology but I am certainly using it to my advantage,” Ruff says. “I use an 80 camera, 24 Mpx array, which instantaneously captures a body or face in what is called a near real-time system. Multiple cameras capture a decisive moment in time from many angles. When these frames are edited together, the moment appears frozen as we move it around. Ruff says that in the movie The Curious Case of Benjamin Button, where Brad Pitt is born old and dies young, the actor was shot at his own age in every sequence, but 3D modelling and Paul Ekman’s FACS (facial action coding system) allowed post-production to age him and make him look younger, as well as transporting his head onto other people’s bodies. “The reality is that you only need to shoot actors once now and you can manipulate their image to anything you want for the future,” he says. Ruff, who says he is the only person in Australia developing this type of technology, is working with Hollywood producers and Australian sports bodies on 3D imagery. He says the possibilities are endless. Ruff says once a 3D model is created, it can easily be turned into a figurine and printed in full colour up to 34 centimetre tall. However, that is only the tip of the iceberg when it comes to 3D printing. David Lennon and Alex Goad have co-founded the Reef Design Lab, which is dedicated to advancing the effectiveness of purpose-built reef units, as well as marine infrastructure such as jetties, rock walls, marinas and canal estates. 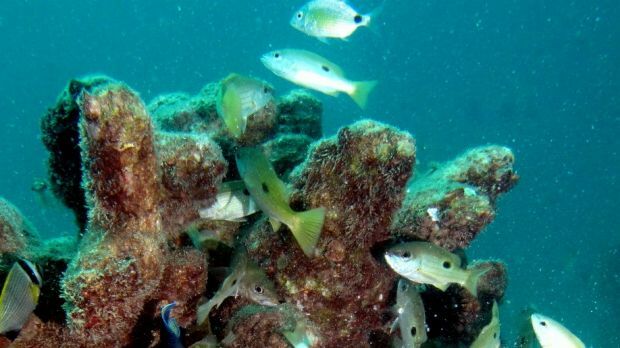 Lennon and Goad have designed the modular artificial reef structure (MARS) to recreate a highly conducive environment for sea life in areas in which natural habitats have been damaged or destroyed by pollution, climate change, destructive fishing practices and other human activities. Lennon has worked with James Gardiner, a Sydney-based architect who identified 3D printer manufacturer D-Shape in Italy as a potential manufacturer of constructed reef units. The one issue Lennon faces is cost. The reality is that 3D imagery is expensive and like any new technology, it gets cheaper as more and more people use it and more companies start manufacturing machines. While 3D printing artificial reefs is a big job, something of a smaller scale is a lot easier and cheaper, such as surfboards. Gary Elphick started Disrupt Surfing just over a year ago because of his frustration with surfboards being mass produced. Elphick, who ran a surfing accessory business, thought the individuality of surfboards was getting lost. Disrupt Surfing uses 3D printing design technology to make a digital set-up of the surfboard and then the customer can direct the art, finish and design. “We make a digital file from the customer’s request; we then create a 3D render before we 3D print the design using a new heat-sensitive moulded plastic,” Elphick says. “Next, we refine the design until the customer is happy and then we start shaping before uploading the 3D digital file to the shaping machine before being glassed and sprayed. The board is then ready for surfing. Elphick initially started working from home before renting premises on Bondi Beach. However, he only takes online orders. “We had queues outside our building and it was annoying the landlord and other tenants, so we decided to move to our own premises,” he says. Earlier this summer, Russia’s parliament took the controversial step of banning all underwear made from synthetic lace, preventing its manufacture and sale within the country. But if Russians don’t like the ban, which labels the undergarments as harmful to Russian’s health, they can always make their own — if they have a 3D-printer. “Lascana was definitely the craziest thing we have been asked to print,” 3DPrintus founder and CEO Konstantin Ivanov told The Moscow Times. The project took more than three months and is the first underwear to be printed in Russia. But 3D-printing isn’t just a novelty. The business, once confined to research laboratories, is on the rise in Moscow. The process, in which printers lay down layer after layer of material, is hailed as revolutionary because it allows manufacturers to move production away from huge factories in faraway countries to more tailored, localized production. There are about a dozen 3D-printing companies in Moscow. Businesses like 3DPrintus allow designers to upload their designs onto an online platform — http://www.3dprintus.ru — for customers to choose from. The customer then selects the product they want and chooses the material they would like it made from. “It allows designers to create a product and bring it to the public for much cheaper than if they were to make it in a factory,” Ivanov said. The variety of materials available is vast: everything from synthetic plastics to silver and gold. Even Ivanov’s wedding ring, consisting of two intertwining bands of yellow and white gold, was printed with one of the machines. For a precious material like gold they first made a prototype, then a mold out of wax and finally the ring. Although the 3D-printing process takes a long time, techniques are developing rapidly. When creating material out of stainless steel, for instance, 3DPrintus uses a computer to spray steel powder in layers, much like an inkjet printer. This spray method can create much more intricate designs. The company is currently in the experimental phase of creating a powder out of gold that would open the door for much more intricate designs and make the process much faster. To prove how versatile the products from the printers can be, Ivanov made a 3D model of a Moscow Times reporter, a “3D selfie” he called it. The process started by taking pictures from every angle. The photos were then uploaded onto a laptop that started processing the images. First making a rough outline of the pictures to create a 3D image, it repeated the process each time with more detail until a mesh of points was created and a 3D version appeared on a screen. This image was then sent to printers located in a large warehouse on the outskirts of Moscow. A week later the “selfie” was ready. The amount of detail was incredible: everything from dress creases to the details of shoes. Many say that 3D-printing could open a world of opportunity. Aid agencies can use them to cheaply create items needed for water sanitation or replace missing items in aid packages. British company ScanLAB, for instance, has been working on a project with Greenpeace to map icebergs to aid in research about climate change. But while there is no denying that 3D-printing could be used for a lot of good, there is also the potential that the technology could be used for dangerous and possibly destructive purposes. Blueprints for creating guns using a 3D-printer can easily be found online. And because the weapons could be made of plastic, they could even slip unnoticed through airport security. But for now 3DPrintus will likely stick to underwear and other more peaceful items. And while Ivanov scoffs that 3D-printing will ever really replace mass production, the idea of something made-to-order yet affordable is certainly appealing.